York County, Pennsylvania has produced its share of authors and history, biography, and poetry are always popular. Henry Lee Fisher (1822-1909) combined all three in his narrative poems written in the Pennsylvania German dialect (Pennsylvania Dutch). 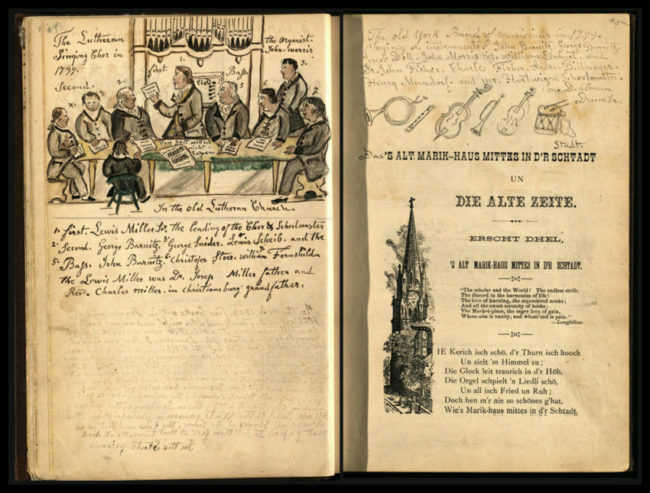 His book from the collection of the York County History Center, ‘S alt Marki-haus mittes in d’r Schtadt, has been scanned in color and is presented in the following digital exhibit. The book includes illustrations by York artist Henry Barrett, as well as drawings in color with handwritten descriptions by York folk artist Lewis Miller. Henry Barratt (1817-1891) was an artist who captured York people and scenes of over 100 years ago. He is listed variously in York City directories as a photographer, an artist, a crayon artist, and as proprietor of his own drawing school. Yorker Lewis Miller (1796-1882) stated that his aim was to chronicle York in his art, succeeding so well that York has been called the best illustrated American community of the nineteenth century. Lewis Miller used his copy of Henry Lee Fischer’s book ‘S alt Marki-haus mittes in d’r Schtadt (1879) to further document his life and memories of York. Drawings in color with handwritten descriptions can be found throughout the book. This exhibit was made possible through the Google Cultural Institute.